Chest discomfort.Most heart attacks involve discomfort in the center of the chest that lasts more than a few minutes – or it may go away and then return. It can feel like uncomfortable pressure, squeezing, fullness or pain. Other signs. Other possible signs include breaking out in a cold sweat, nausea or lightheadedness. 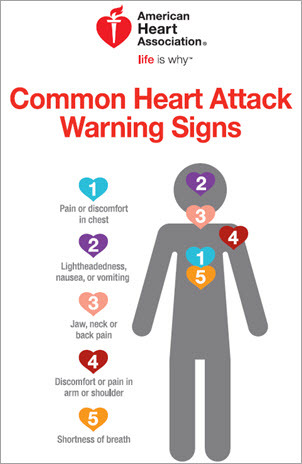 Download our heart attack warning signs infographic (PDF). 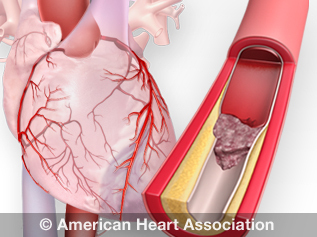 Learn about the warning signs of heart attack in women. Learn the signs for heart attack, and remember: Even if you’re not sure it’s a heart attack, have it checked out. Minutes matter. Fast action can save lives - maybe your own. Call 911 if you experience heart attack warning signs. Calling 911 is almost always the fastest way to get lifesaving treatment. An emergency medical services (EMS) team can begin treatment when they arrive – up to an hour sooner than if someone gets to the hospital by car. EMS staff are also trained to revive someone whose heart has stopped. Patients with chest pain who arrive by ambulance usually receive faster treatment at the hospital, too. 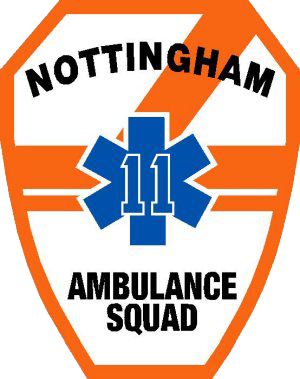 For many reasons, it’s best to call 911 so that an experienced EMS team can begin treatment and arrange rapid transport to the emergency room. Watch an animation of a heart attack.